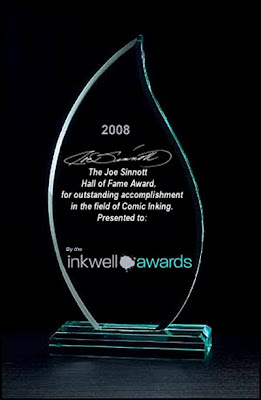 Voting has started for the 1st Inkwell Awards. Scoot on over and cast your vote because you know the rules - if you don't vote then you're not passing commentary on who wins - you're just whinging. If you've for a favourite inker then cast a vote. If you like someone's work then go ahead and let the world know. And if you're an inker and want to vote for yourself, well don't be shy and retiring, get right on in there and do so. Voting will close at the end of May, you've got plenty of time, so no excuses. Don't think about it, just vote for it. I've spent all day thinking about the loss of Jim Mooney. I've spent the entire day trying to think of one panel that would sum Jim up for anyone who wasn't aware of his art - those rare creatures who've never seen any of Jim's work in any comic books. I'm sure there must be a few, not many, but a few. And here it is: Streaky! 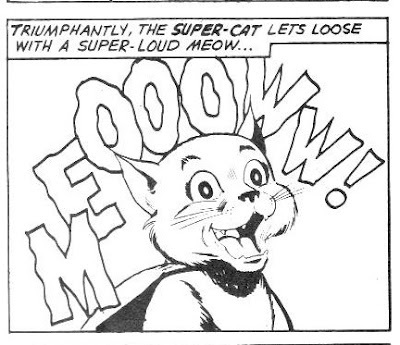 This is the panel where Streaky The Supercat discovers he can beat up dogs - the look of sheer joy on his face is a delight and I can imagine that Jim laughed his way through that one. He loved that little cat, but then he loved all cats, they were his delight and joy, along with his kids and his wives. It's one of the saddest days I can recall today. Jim Mooney, a damn good artists and more importantly a friend of mine, passed away this Sunday just gone at the age of 89. 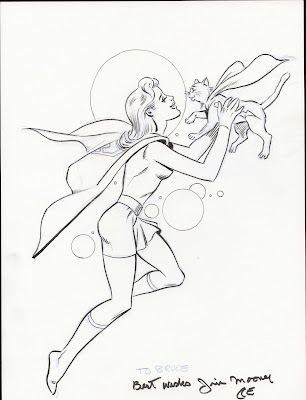 Jim was more than just a comic book artist - he was a consummate professional. There was nothing he couldn't draw, nothing he wouldn't try to draw. He was as good as they came. But there was more to Jim, much, much more. He worked at virtually every major, and not so major, company over a career that spanned nearly seven decades. His first work appeared in print about 18 months after the debut of Action Comics #1 and he worked well into the 1990s and off and on into early 2000, along the way becoming one of the most prolific artists of the genre. Indeed it could be argued, and I suspect successfully, that Jim drew more pages than anyone else. He penciled, he inked. But there was more to Jim than that.